India vs Australia 4th Test Sydney: A phone call derailed Australian skipper Tim Paine's press conference after play on Day 2 at Sydney Cricket Ground. India vs Australia 4th Test Sydney: A phone call derailed Australian skipper Tim Paine’s press conference after play on Day 2 at Sydney Cricket Ground. The press conference took place after the Australians had a long day on the field as India put on 622/ dec. Paine, who must have had a day to forget on the field seemed to have got cheeky again on receiving the phone call. 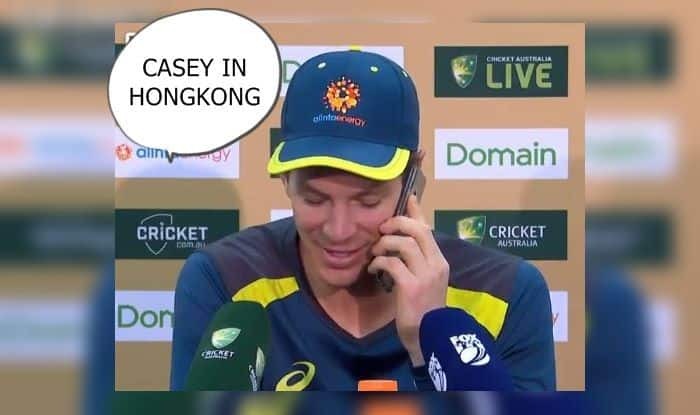 Paine received the call and said ‘Tim Paine Speaking, who am I speaking to” to which he may have got a reply saying ‘Casey From Hong Kong’. Tim Paine Speaking, Who is it sorry? Oh, okay who are you after? Casey in Hong Kong. Oh Martin! Oh alright, he’s in the middle of a press conference, can I get him to call you back? Alright, no worries, I’ll tell him to check his emails. Alright, thanks Casey, cheers. Earlier, the top-scorer of the series Cheteshwar Pujara missed out on what would have been a well-deserved double hundred, ending at 193 off 373 balls, adding 63 runs to his overnight score. Meanwhile, Pant became the first Indian wicketkeeper to claim a hundred Down Under with an unbeaten 159-run effort that came off 189 balls on the second day of the match. This was his second Test hundred, the first being in England earlier this year. The Australian bowlers were also tormented by Jadeja (81) and the home team’s desperation for a breakthrough resulted in even top-order batsman Usman Khawaja being pressed into the attack. Pant, who struck 15 fours and a six, he put on 204 runs for the seventh wicket with Jadeja.